Curb appeal is not only advantageous when selling your home, but it lends your home more overall value and a unique standing in the neighborhood. A home is a reflection of oneself and their values. A well-kept home makes a good impression, but what about that front door that’s falling apart? Time to replace it! Believe it or not, a front door goes a long way in boosting your home’s curb appeal, giving it that unique look that sets you apart from the neighbors. Think about it; what’s the first thing your guests come into contact with your home? The front door, of course! It’s how you welcome them to your home, the gateway to your private life, so to speak. When you welcome guests through a door that’s cracked or warped or falling apart, it gives the impression of dilapidation and neglect of your home. It can stick out like a sore thumb against your home’s exterior, easily seen from the street. If your door looks like the entrance to a retro exhibit at a museum, it’s probably a good idea to replace it. Security is one of the biggest considerations for a front door replacement. A front door with solid hardware, new locks, and is intact, looks great, but it also looks secure. The look of your door serves a much larger purpose than simply accenting the home’s exterior. Thieves and home invaders look for weaknesses when scoping out a home, and you don’t want that to be the entry to your home. This is basically an invitation to any would-be invaders to “come on in!”. A secure home looks good, and not to mention can help to put your neighbor’s minds at ease. While solid doors may seem more secure and private, a door with window panes can offer a nice touch to your home’s exterior. Accented with some outside porch lights, the glass can create a beautiful image at night and offer you a glimpse of the outside world. Matching the color of your front door with your window shutters is just one example of how a front door can help make your home stand out. There are many colors and variations that you Percan try with your door to help make your house “pop”. 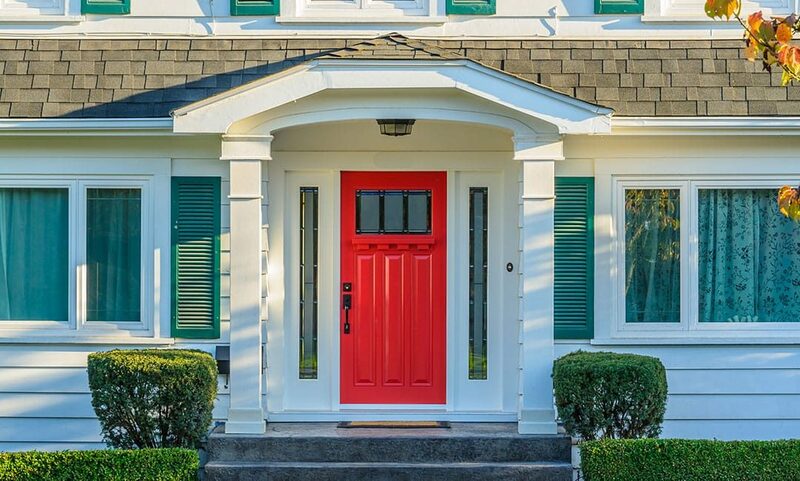 A brightly colored paint job can add some individuality to your door. You can also add some new house numbers to accent the color and style of your new door. Large, clear numbers are easier to read in the dark and can make your home easier to identify. In addition to house numbers and some lighting, some new hardware (locks and knobs) serve to make your door look even better. Brass colored hardware is a popular choice and comes in many shapes, sizes, and color variations. Choose a hardware set that will make a bold statement about the rest of your home. It’s a good idea to match the deadbolt (if you have one) with the handle hardware, so as not to have any unnecessary color clashing. Functionality is essential to a front door’s curb appeal. You can paint a door with high-quality material, fix the dents and cracks, but if the door doesn’t open and close well because of warping or rot, the curb appeal drops dramatically. Doors serve energy efficiency and security functions as well as privacy. A door that doesn’t open and close easily, probably has other issues as well, such as moisture buildup which can cause other problems. Moisture creates and helps breed mold, which promotes the rot of organic materials like wood. If the rot spreads to your siding or door frame, the entirety of your home’s exterior can begin to sag and look beaten down or broken. Rot spreads quickly under the right conditions, and if your poorly functioning door is letting moisture into the home, it’s feeding the mold and adding to the rot problem. When a buyer or a visitor comes to your home, you want them to feel at home. Easy, relaxed, and carefree. A damaged or broken door can create tension and anxiety. From the street, it makes the home look uninviting and neglected. We all remember how special grandma’s front door was; a beautiful wreath hanging from it, a fresh coat of paint, and not a scratch on it. This was a door you wanted to walk through, it ignited curiosity as to what was inside. This is the effect you want your front door to have on visitors. If your door is inspiring conversations about its retro look, it’s time to think about a replacement. When home improvement time rolls around, homeowners tend to neglect the front door, not remembering that it’s one of the most additions to your home. Once the door surpasses its lifespan, no amount of paint or repairs can make it look new again. Take the time to remember to replace your front door, and you’ll find better functionality and aesthetic value in your home overall.